For picnics, camping, RV, backyard parties and emergency uses a portable power battery station is an excellent way to power up all your personal electronics. The battery stations will handle your smartphones, tablets, computers, lights and even televisions for hours at a time. Coupled with a solar charging system, you can have a nearly unlimited amount of small scale electricity anywhere you go. We explore the Jackery PowerPro / Explorer 500 and the Goal Zero Yeti 400, as well as some lower wattage units, and portable solar panels. Unlike a gas generator, the battery stations are quiet and do not produce toxic fumes / carbon monoxide (CO) gas. So these are safe to use indoors as well as in the great wide open (where your power system won’t bother your fellow campers). In this review / buyers guide, we focus on Lithium-Ion (Li-Ion) battery stations rather than those made with lead-acid (e.g., car / marine batteries). The Li-Ion are lighter for the same amount of power storage, and have a better cycling capacity for these types of uses (you can expect to get around 500 to 1,000 cycles at 80% to 100% discharge). These battery stations are also designed for recharge with solar panels, as well as standard outlet AC or automobile converters. With the solar, you can be assured of a continuous power supply (as least as long as the sun is shining) for zero cost. Compared with having to bring gasoline to run a traditional generator, we think this is the way to go. 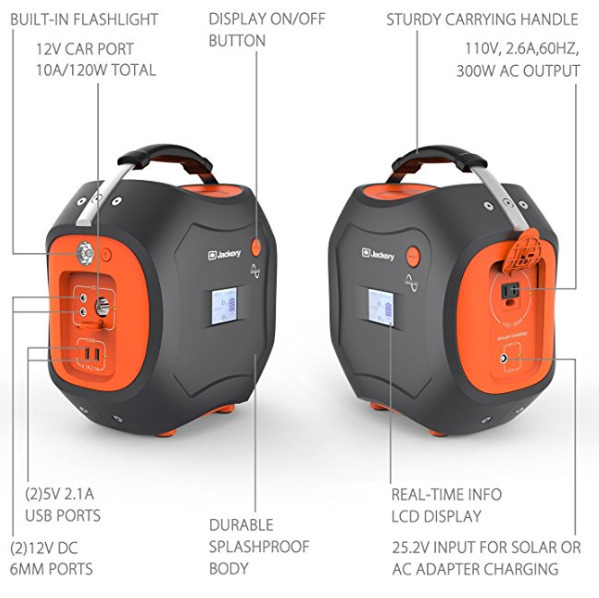 If you are frequently outdoors or are in an area that can get power outages (especially for hurricane, wildfire snowstorm and other natural disasters) you should seriously consider getting a portable battery power station to have on hand when you need it. The Jackery Portable Power Station, Powerpro 500Wh (about $600) tops our list for the sheer storage capacity and great features at this price point. (FYI – you may also see this called the “Explorer 500” which is the same unit). We really like that the PowerPro 500Wh battery station is the smallest (12.2 x 6.5 x 10.2 in) and lightest (under 13 pounds) portable rechargeable lithium battery generator in it’s class. This size and weight are important when carrying it from the car to your camp / picnic site. The other item that sets the Jackery Portable Power Solutions apart from other manufacturers is their commitment to consumer protections and safety. This is an ETL Safety Certified,(similar to UL Certification for safety) battery management system (BMS), so you can be confident when using it that Jackery offers you and your devices complete protection. The AC outlet provides “pure sine wave” electricity, similar to what you get from the power company that comes through your home electrical outlets. A pure sine output is important when powering small appliances (TV, coffee maker, dorm refrigerator, etc.) and motorized (e.g., coffee grinders, drills, saws, etc.) to keep them from overheating and to help protect their sensitive electronic components. With a single charge, you can expect to: watch TV for about 3 hours or power your mini-fridge, recharge 3 laptops, power up 6 smartphones, blend a dozen smoothies and more. But the best thing is that you can do this while the sun is shining, and still have power for the rest of the evening. When heading on the road, it’s best to start with a full charge. When powered from a standard AC wall outlet, it will reach reach full charge in about 6 hours. With the 100W solar panel, the Jackery PowerPro can be fully re-charged in about 7 hours or less in full / direct sun (Solar Panel must be purchased separately ). The best deal is to buy the packaged PowerPro with the solar panel (see below). The Jackery Portable PowerPro 500Wh + 102W Solar Panel (about $1,000) combination means that you can continuously run your personal electronics while the sun is shining, and use the stored battery power for after the sun goes down. The 102W solar panel will fully charge the 500Wh battery in under 7 hours with full sun. Or you can use the USB outputs on the panel to directly power some devices while also charging the PowerPro. The most common setup is to simply connect the solar panel to the PowerPro, and use the PowerPro as you normally would. Any amount of solar generated electricity that’s not being used for your devices will charge up the battery. Of course, this means it’ll take longer to fully charge the PowerPro. But on a sunny day, this shouldn’t be an issue. The panel has a peak output of 3.15A at 32.4V for a total of 102W. With an industry standard “Anderson connection”, you can use the panel with other equipment in addition to the Jackery products. Like the battery station, the solar panel is compact and lightweight. It’s made up of 4 individual panels, which fold down to the size of a single panel. There is even a built in carrying handle for easy carrying. And it slips into a carry bag to keep out the dust and scratches. Weight is just over a pound. When folded, it’s a compact 20 x 16 x 1 inches. Opened for solar power, you’ll have a full 40 x 32 x 0.25 inches of panel. The Yeti 400 Lithium Portable Power Station (about $600) from Goal Zero is our runner up / alternative to the Jackery. The Yeti 400 is nearly a tie with the Jackery for capacity and features, but has about 15% less battery capacity at 428Wh (compared to 500Wh for the PowerPro) for the same cost. The Yeti 400 can get a full charge from a standard 110V A/C wall outlet in about 5 hours. Using the 100W Goal Zero solar panel will take around 8 hours with good sunlight. The A/C output produces “pure sine” electricity from its inverter. The Yeti has one of the highest instantaneous surge ratings for battery power stations – 1200W. This is important since appliances with motors or compressors (hairdryers, blenders, refrigerators) with have a high current demand when they first start. The high surge rating means that the power station won’t temporarily shut down due to a high current draw condition. This auto shut down feature is common to all power stations for safety reasons, and for proper operation. Combining all of these together, you can power up to 7 devices at once with a maximum of 39,600mAh at 10.8V or 119,000mAh at 3.6V. The Goal Zero Boulder 100 Briefcase is a 100 Watt Monocrystalline Solar Panel (about $300), making the combination with the Yeti 400 power pack around $900 (about $100 less than the Jackery combo). The Boulder solar panel has a maximum output of 7A at 14V to 22V, depending on the amount of sunlight. It will take about 8 hours of full sunlight to fully charge the Yeti 400. This is a sturdy, well constructed unit made of rigid, anodized aluminum and tempered glass. It folds in half to a briefcase size, and has a metal rack-stand when set up for operation. It’s one of the most rugged solar panel units we’ve come across. Being well made also means its nearly 26 pounds. When opened, it measures 40.0 x 26.75 x 1.75 inches, and closed it’s 20.0 x 26.75 x 3.5 in. It also has a heavy canvas carry bag, so you can pack this to your site and then put it back in the bag for storage. No worries about scratches! All of the Goal Zero portable solar panels, with the exception of their highest output “Boulder 200 Briefcase”, use a standard 8mm connection. These will all connect directly to their Yeti power stations. The 200W Boulder uses the “Anderson Connection” (same as the Jackery), and you would need to purchase an 8mm Combiner to Anderson Connector Cable (about $25) to use it. If you want to position the power station away from the panel, the Goal Zero Extension Cable is the way to go. This is 30 feet long, made from 16 gauge wire and comes with the 8mm connector used by all the Yeti power stations. Very useful for placing the panels in the sun while keeping the battery system in a shaded, sheltered area, away from passing weather, direct sunlight, dust and insects. The battery runs best when it’s not out baking in the direct sunlight, and the panels should be positioned to maximize the amount of sun. With 30 feet of cable, you can do both! This is also great to use with the Goal Zero combiner cables, so you can combine up to 4 panels and then connect to this cable to run to the power station. One last option if you don’t need that much power is the 240Wh “Explorer 240” Portable Power Station from Jackery (about $300). You get a 110V A/C (200W max) outlet, a 12V DC Car Port and two 12W USB (2.4A at 5V) ports. It’s a compact 9.0 x 7.8 x 5.2 inches, and only weighs 6.6 pounds. With the 100W solar panel, you can recharge in about 3 hours. But for this unit, you may want to also go smaller and lighter on the solar panel, and use 50W Solar Panel (about $200). Charge time will be about 7 hours with the 50W panel. The Explorer 240 has all the same features as the larger unit, just scaled down for a lighter load. Whichever you select, you’re sure to keep all your essential electronics powered no matter where you are.